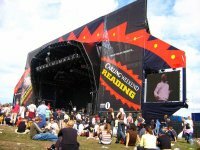 One of the English summer's great festivals of music, the Reading Festival boasts many of the biggest names in Pop/Rock/Indie/Folk and Comedy. The event is increasing in popularity each year and tens of thousands make their way to the fields to enjoy the finest in popular and world music. The festival normally falls on the bank holiday weekend in August. Over the same weekend, a sibling festival is held in Leeds. Headliners like the Red Hot Chilli Peppers, Arcade Fire, Nirvana, Queens of the Stone Age, Blur, the Kaiser Chiefs, Bonnie Tyler, Muse and Eminem have drawn massive crowds.